The Kid loves these Lego gummies, so I decided to make the rest of his lunch as Lego like as possible. I don't generally do theme lunches, and this is the kind of cutesy thing that I swore to avoid as a mom. It is also painfully clear that I will never earn a living sculpting vegetables into flowers on a cruise ship. That being said, the day is coming soon when it will require expensive electronics to make him as happy as an assortment of rectangles in his lunch box do now. The sandwich has soy spread and strawberry jam with more soy spread used as glue to hold the raisins onto it. I broke a graham cracker into little rectangles and tried to carve a couple pieces of carrot into Lego blocks. There's a handful of red grapes and a bottle with half apple juice and half water to round things out. Update: Sharing this lunchbox with Bento of the Week. That is such a sweet - and cute - idea! I love how you cut the carrots! I wonder if I could finally get Alex to eat carrots now? It's one of the more neglected vegetables in our house. I finally got my meme response up here. OK, I've read all of your luchbox posts and I'm not seeing it, so I'm going to ask you. Where did you get those divided containers? Who makes them? I am attempting to make an allergy friendly pizza "Lunchable" and that is exactly what I need! Thanks. maggie-the Lego lunch madness started when I thought that carving the carrots might get The Kid to eat more carrot. The joke around here is that he thinks carrot is a garnish. Sigh. foodallergymom-I got two of these containers from the dollar section at Target over a year ago. Now I'm wishing I had bought more! The dollar section tends to rotate seasonally, so just keep your eye out. I'll put up a post if I see them again. The dividers don't come up all the way to the top, but I usually put a napkin on top of the food, and there's generally not too much self rearrangement by the food. I'm very impressed by your lunch box creativity! Great job! Hi! 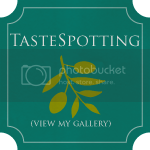 I am way behind on my commenting, but I wanted to thank you for linking up at Bento Blog Network. 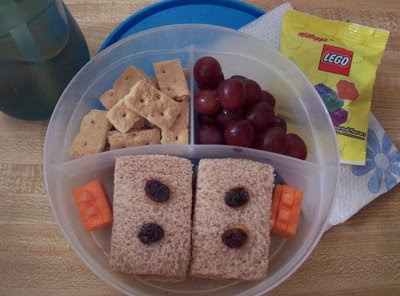 Your lego lunch is very cute. 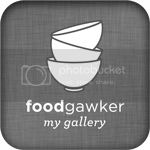 I am following your social media and have added you to our sidebar blog roll. I hope you participate again!